Hello! Jennifer from Satsuma Designs here and very excited to be back at Just Us Four blog – thank you Shannah! At Satsuma Designs, I create Seattle-made baby products and content that help make caring for kids as easy as child’s play. Click here for a fun offer to help your kiddos thrive! Do your kids have Father’s Day gifts all wrapped up? If they’re like mine, they’ve made a cute card at school, but want to have something to wrap up for Dad to give him on Father’s Day, Sunday, June 21st. I thought it would be a fun pun to use Dad’s shaving cream to make art, add a special note and create a laminated luggage tag that he can take on the road with him or wrap around his briefcase to take a little visual reminder of how much he’s loved everywhere he goes. 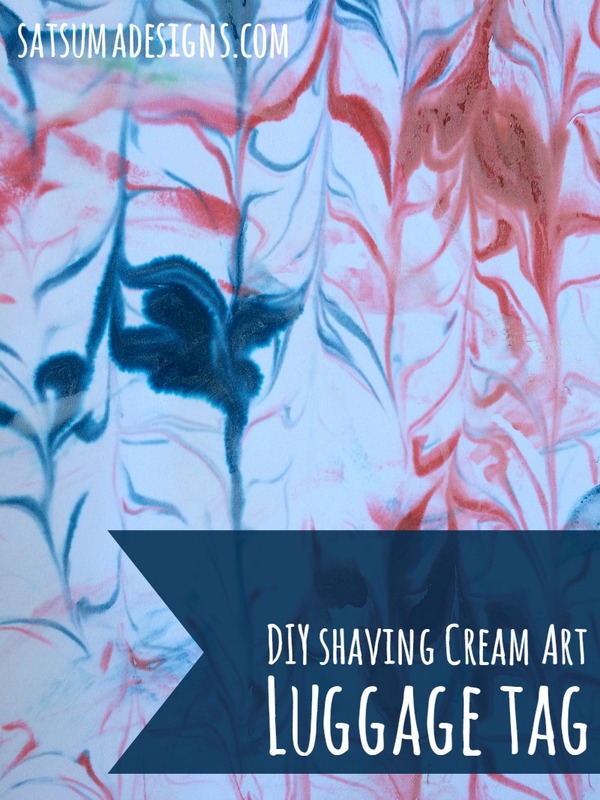 Here’s how your kids can make a Father’s Day shaving cream art luggage tag. This is a two-part post with the second part of the story over at Satsuma Designs. Here I’ll teach you how to make the art and at Satsuma Designs, I’ll show you how to create the personalized luggage tag to give Dad on Father’s Day. Hello! Jennifer from Satsuma Designs here and very excited to be back at Just Us Four blog – thank you Shannah! At Satsuma Designs, I create Seattle-made baby products and content that help make caring for kids as easy as child’s play. 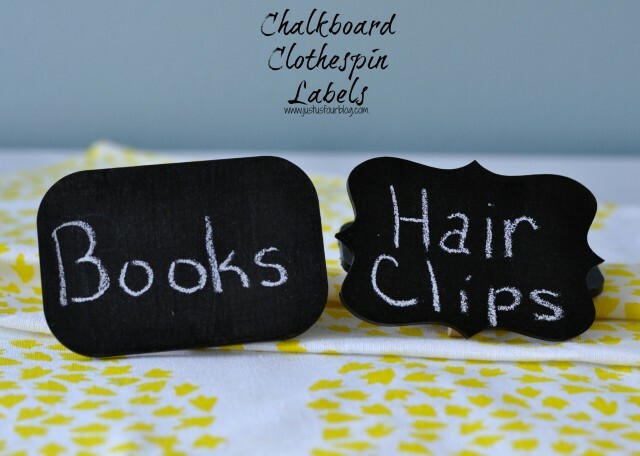 At my blog, you’ll find crafts, organizing tips, recipes, holiday and everyday treats to delight you and your kiddos. Come by for a visit! Do you and your kids love to surprise neighbors and friends with May Day flowers on May 1st? We do and if it’s not raining in Seattle this year, I want to drop a little butterfly on each doorstep to welcome spring in with a bang. Here’s an easy May Day craft to try with the kids. 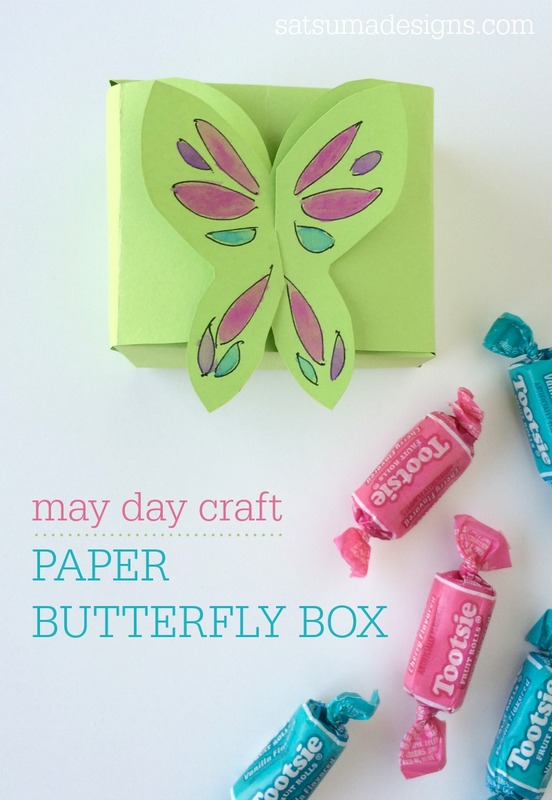 My Paper Butterfly Box requires only a few materials that you’ll have on hand and what’s more is that you can fill each little box with leftover Easter candy! There are a few bloggers that I am lucky enough to have met in person and develop a friendship with. We may live crazy far away from each other but we chat online and keep up with each other. Kim is one of those bloggers. In person, she is awesome and I am always so impressed by her projects online. These chocolate chip cookie earrings are no exception. They make ME want to go and make a pair…oh, and maybe eat a cookie! Hi everyone! My name is Kim and I blog over at seven thirty three. I love to share kids crafts, free printables, party ideas and more. My 5 year old daughter wants to get her ears pierced SO bad… but she is too afraid. She has literally sat in the chair three times now. She makes it to the part where they go to add the little purple dot to her ear and she bolts. Seriously. Jumps OUT of the chair and runs. She received a pair of Christmas clip-on earrings two Christmas’ ago and keeps asking if I can make her a pair. I finally decided after her last bolt from the chair that I would go ahead and make her some. I picked up the clips at Joann’s – though I was a bit bummed that they didn’t have a smaller option. This post is sponsored by RoseArt. However, as always, all thoughts and opinions shared here are 100% my own. Christmas gift shopping for littles can be a challenge. If yours are like mine, their tastes change daily or they circle everything in the catalog out of pure excitement over the gift receiving part of the holiday season. 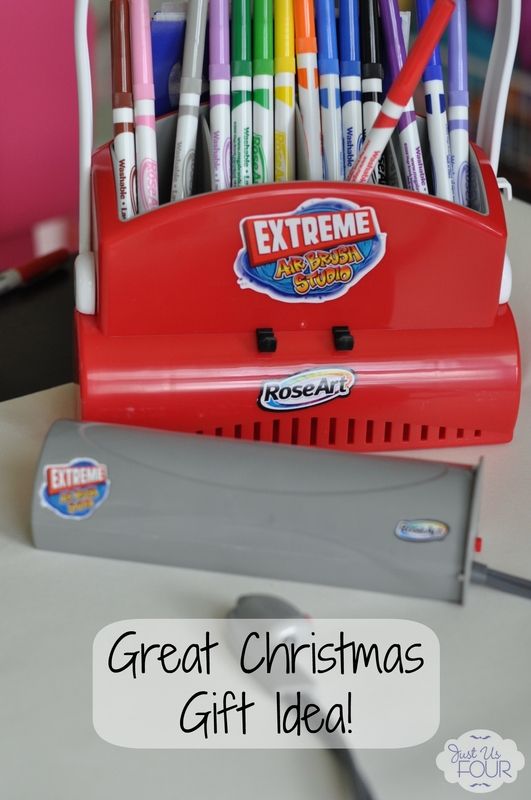 RoseArt provided me an opportunity to try out their Extreme Air Brush Studio and I am so glad they did. I now know what just about kid on my list that is over the age of five will be getting for Christmas from us…it is a great gift idea for kids. Last Valentine’s Day, I saw this mirror on The Thirty Sixth Avenue. 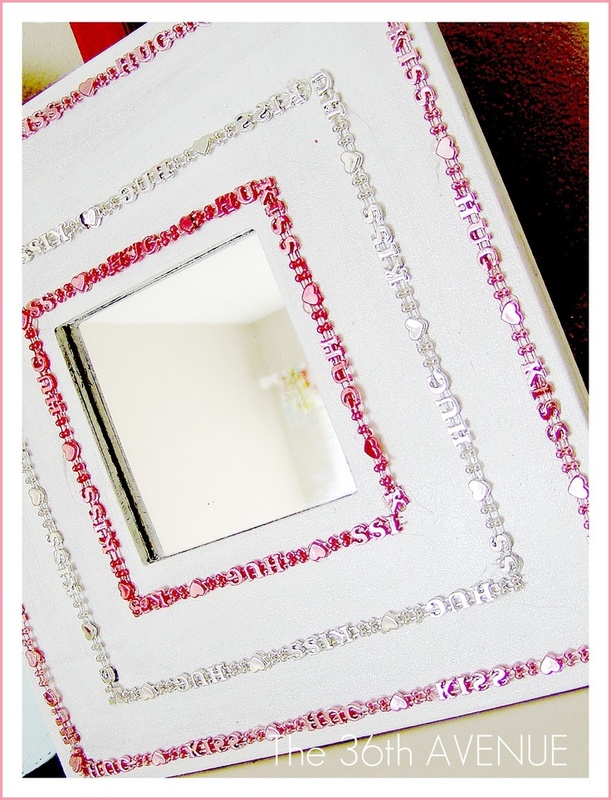 I loved the mirror and knew I wanted to make something similar for H. I found a mirror and ribbon at Michaels right after Christmas for less than $3!